Current state of the wind (the “wind oval”). This shows you whether the wind is currently left or right, and higher or lower than average (in this case, mid speed and direction). Times to the line, in this case, ‘burn time’ which is the stopwatch reading when you get there. These are estimates of the time to each end, where you will intersect on your current heading, and the Dogleg starting point (that “0:00/+1.3kt” point which says you will be going 1.3 knots above target speed when you cross). Learn more about the Dogleg start. Adjustable predictor showing where you will be in 10 seconds. Optional Burn time. This feature displays line times in terms of what the stopwatch will read when you get there (you will be 54 seconds late at the port end – duh!). This makes it easier to adjust your starting strategy to arrive at the line exactly on time. 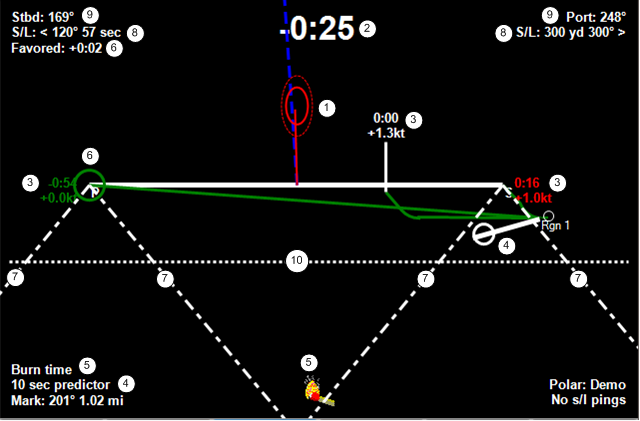 Favored end as number of seconds advantage (port end by only 2 seconds in this case). Laylines to the pin and flag. Line bearing and length in yards and seconds (57 seconds heading 210º and 300 yards heading 300º in this case). Compass course of port and starboard tacks (169º for starboard, and 248º for port tacks). 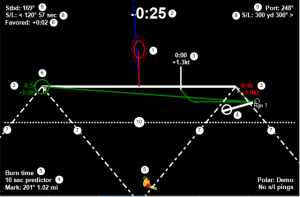 The Overspeed line above which it is possible to cross the starting line above target speed (see Dogleg start). The starting line is the most critical aspect of sailboat racing. When sailing, starting line awareness is critical, and plays a huge role in the outcome of the race. Today’s modern graphical displays make sailing starting line success much easier, and Ockam is at the forefront of of that. Want to win your next start? Use Ockam’s Sailing Starting Line display!